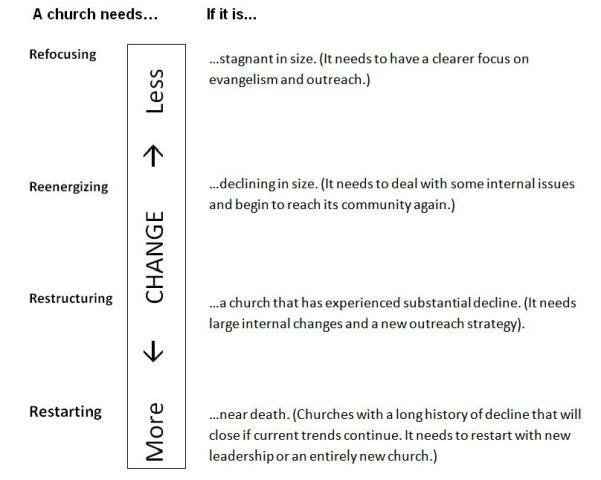 With over 70-80% of churches plateaued and declining, church revitalization must be a major topic of conversation for church leaders and strategists. In the last two posts (Diagnosis and Refocuse & Re-Energize), I’ve shared our developing strategy with the Northshore Baptist Association. So how do we Restructure or Re-Start? Step #1: Decision. The congregation must decide if large internal changes are possible or is it time to close the doors & allow something new to be born. All living things are born, they live, & they die. No New Testament Church still exists today. But even if a church continues it must die to its current way of thinking, so that a new vision can develop. Living things experience death as they age & mature & adapt to changing environments. Every growing church has had to die to various ideas, paradigms, and programs in order to grow. A final death that doesn’t lead to growth as the church exists may happen when we are unable to continue to adapt & grow through challenges faced. Can we afford the large internal changes that are needed? Do we have the resources, energy, & determination to dream a new dream for our community? From where we are, can we adapt to the changes of our current environment? Reverting to Mission Status & submitting to the authority of another congregation that can assist in dreaming a new dream. If resources are available, working with the local association to develop a plan to Assess, Align, & Advance the mission of the church. Formally decide to close the church, giving the assets & liabilities to the local association so that a new church can be planted or ministry developed. Formally decide to close the church, giving the assets & liabilities to another local church with ties to the local community. Next week I’ll share some of our local success stories and lessons learned. Posted on May 10, 2013, in Ministry, Northshore Baptist Associations. Bookmark the permalink. 3 Comments.